Dimensions 1 by 5.25 by 8 in. Lacking all memory of the first five years of her life because of a brutal trauma, Aurora del Valle is raised by her regal grandmother Paulina and eventually seeks to confront the mystery of her past, in a novel set in late-nineteenth-century Chile. Reissue. A richly imagined historical novel about memory and family secrets from the New York Times bestselling author of Island Beneath the Sea, InÃÂ©s of My Soul, Daughter of Fortune, Zorro, and House of the Spirits. About: Lacking all memory of the first five years of her life because of a brutal trauma, Aurora del Valle is raised by her regal grandmother Paulina and eventually seeks to confront the mystery of her past. 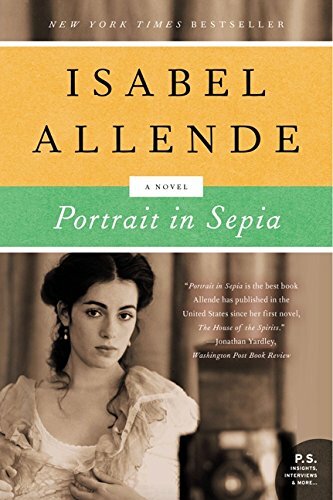 About: "Portrait in Sepia is the best book Allende has published in the United States since her first novel of nearly two decades ago, The House of the Spirits. About: Lacking all memory of the first five years of her life because of a brutal trauma, Aurora del Valle is raised by her regal grandmother Paulina and eventually seeks to confront the mystery of her past, in a novel set in late-nineteenth-century Chile.